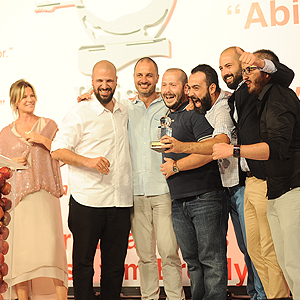 This year is the 24th anniversary of Crystal Apple Awards which was organized by Turkish Association of Advertising Agencies on 28 June in Suada. In this event, the most creative works have been awarded. In the category of Multi-Channel Campaigns, the Supreme Award was granted to Concept Advertising Agency with the spot film titled “Elit, the Master of Chocolate”. Although Elit says “We are Newbie in Advertising but Master in Chocolate” in its ad campaign, it has proved its mastery in advertising with this award, as well. Elit Chocolate has announced that there will be more surprises in the forthcoming films of this series. Elit Chocolate was also granted Selective Board’s Special Award. Director General Burak Halimoğlu, Marketing Manager Tolga Halimoğlu and Mediacom’s COO Özlem Ergazi got the award on behalf of Elit Chocolate. Crystal apple has been organized by Turkish Association of Advertising Agencies since 1989. With this event, the best advertising campaigns and advertising agencies of Turkey are rewarded after being evaluated by a distinguished committee.